Those would have been twisted around each individual pop. 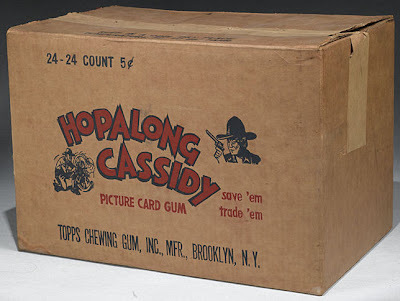 Curiously they state "Made for Topps Chewing Gum" which is odd since Topps owned a plant in Chattanooga, Tennessee at the time that produced candy and table syrup. While that plant was winding down around this time, I believe it was still quite viable for another couple of years. They may have had a Brooklyn candy plant as well, still working on confirming that but Topps may have just decided it was easier to buy lolly's than to make them. 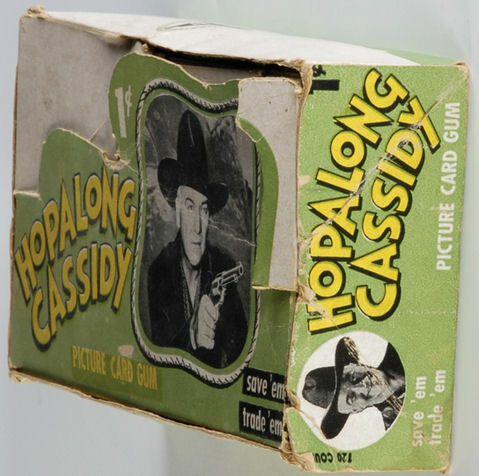 Next time we'll look some third party cross promotions that Topps used with Hoppy. This was just too nice of a graphic to keep on the old hard drive. I think it's from a Legendary auction not too long ago and it's actually the second one I've seen, although the other was in far worse shape. What do I speak of? Why a 1950 Hopalong Cassidy Shipping carton! 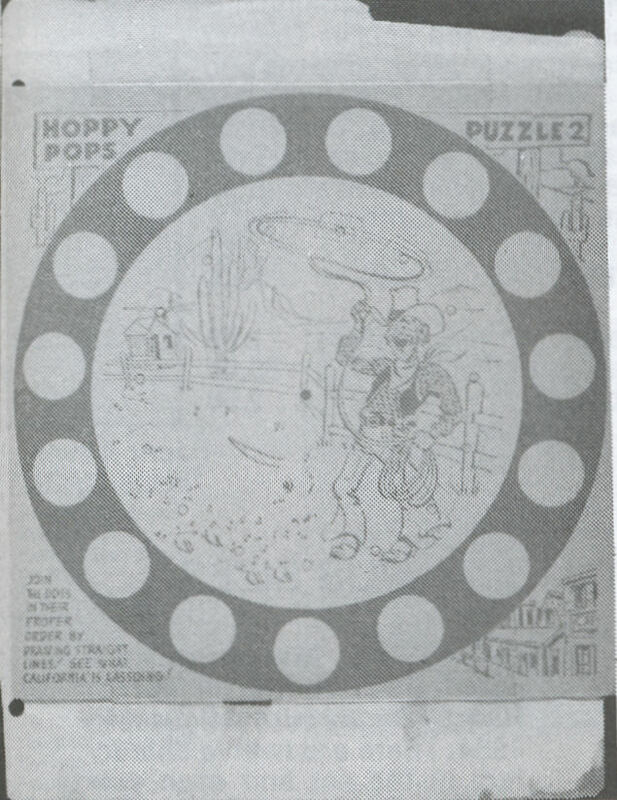 Hoppy still has a few tricks up his sleeve, which I'll get to next time out. Well it's official folks, I am completely flummoxed by the clock at the moment and will be posting a series of shorter posts for the forseeable future. A combination of personal goings-on, summer vacation, my new gig as a highly compensated columnist for The Wrapper, a big project (see below) and various real world intrusions have winnowed my timeslice for this blog into an almost invisible fragment. It's not all bad though, as a lot of of my free time is being spent these days on writing a guide to the early days of Topps, which will be made available when (if?) it's finished as a free PDF download. When that is, I can't say but I'm hoping it will be around the fall of this year. 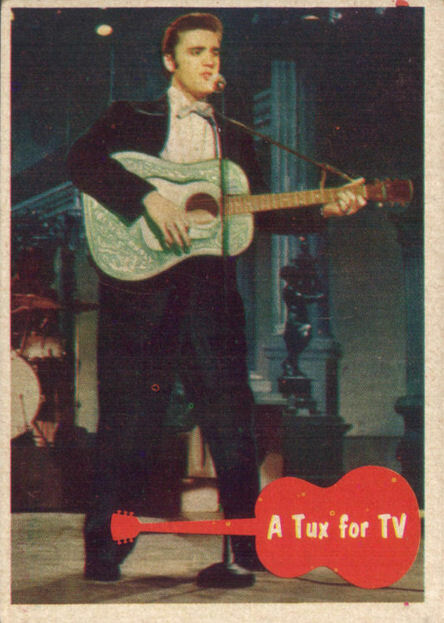 So instead of suspending the blog, which I do not want to do, we'll all have to make do with some Penny Arcade posts, purloined Ebay scans and shorter riffs on ancient Topps ephemera for the duration. I hope to still maintain my twice a week posting schedule though and expect I'll sneak a couple of meatier posts in here and there. Well a little bit of digging and catching up on my e-mails has led to the title of that Willard Mullin sports trivia comic I wrote about recently. Jeff Shepherd (who else?) 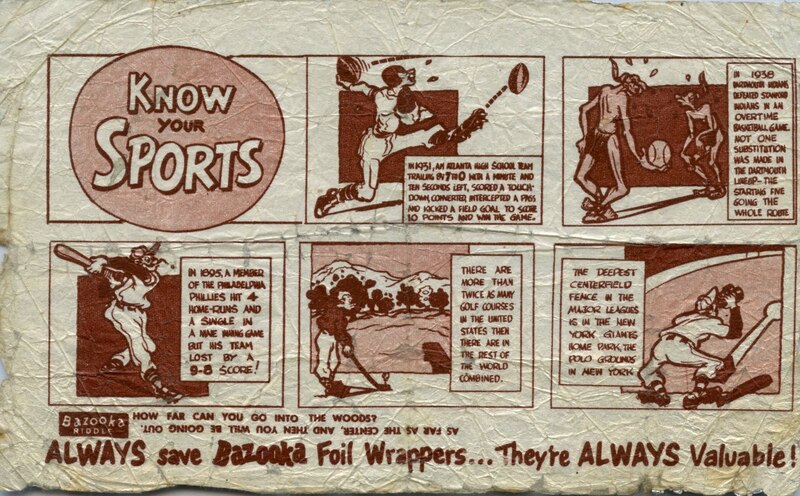 had the details on the set, which is called "Know Your Sports" and appears on both nickel and penny Bazooka wrappers. Penny Bazooka did not exist until late 1949 and Mullin's artwork (who does look to be the artist, despite my wondering if it was someone else last time) seems to be a 1949-50 era license so the timeline makes some sense. 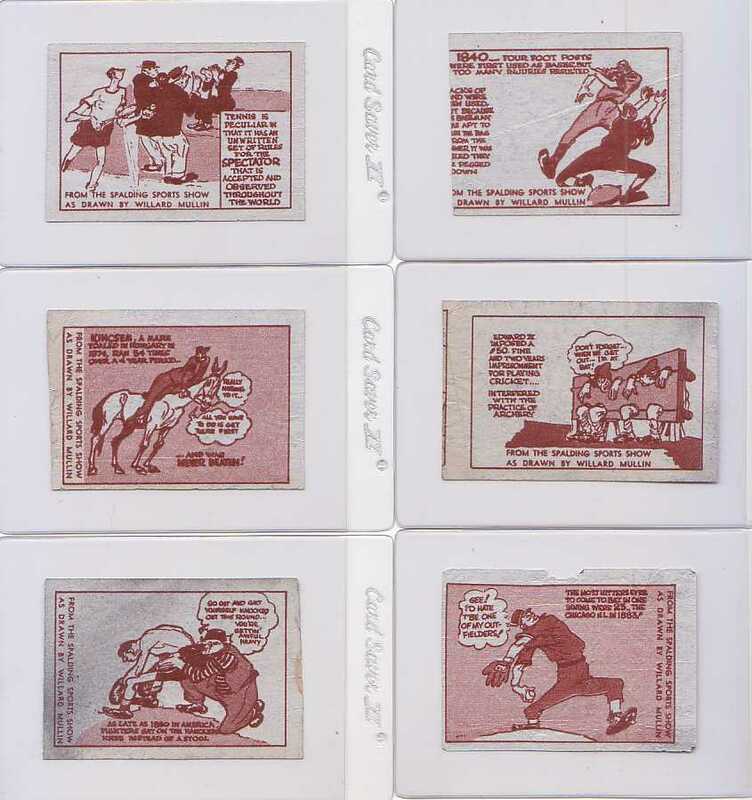 The penny version resembles the Spalding Sports Show comics but lacks the identification on the comic, so these may have been drawn to order for Topps by Mullin. 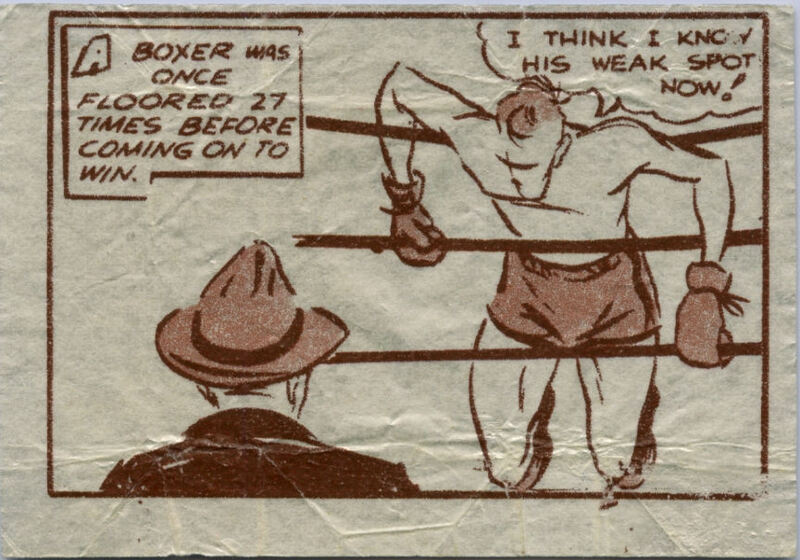 I have to say I am a huge fan of Mullin's work-the way he presents the boxer in the above comic is pure genius. Unlike the Spalding Sports Show comics, these do not have an ACC number. You can see how the panels could be used on either version, another neat little extra. I am not sure if he added the word balloon to the penny version to make it a little more humorous of if such embellishment depended upon the subject matter at hand. The Ripleys' Believe It Or Not! 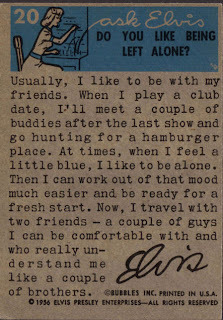 mentality is evident in these, common for the times. Tatoo is a kind of Rosetta Stone when it comes to Topps. 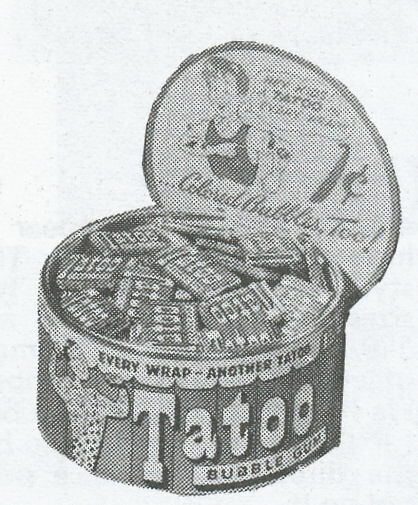 It was the first bubble gum product they produced after the introduction of Bazooka and it also, in a later production run, the first larger sized penny tatoo tab marketed by the firm. It also figured large in a key promotion run by Sy Berger, then just a fresh-faced kid off a GI-Bill education at Bucknell, eager to prove himself to the Shorin's. Tatoo premiered in the summer of 1948, a couple of months ahead of Magic Photos. Sold in something called a tourist pouch at first, a sort of satchel-looking package that--I think--held ten single tabs and sold for a dime. Originally marketed as a party favor or gift, the original wrapper was also the first of its type for Topps as the reverse held a somewhat crude line drawing with spot color made of vegetable dye and primed for transfer to the skin of the lucky recipient with the application of a little water. 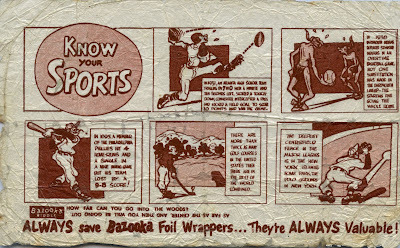 The party box concept would later be revived for Bazooka and if I had to guess, was used for three purposes: 1) to allow Topps to sell a penny product (Topps Gum), a nickel product (Bazooka, which was only a 5 cent roll in it's first two years of existence) and a ten cent product at the same time; 2) Not to step on the sales of their very successful Topps Gum and 3) to allow (I am surmising) the insertion of a contest entry form that was used to gauge the response to the product and which also served as a springboard for a Bazooka promotion. Now, having never seen anything other than a fairly grainy photo of a tourist pouch, this last bit is a leap of faith but it's a theory I believe is highly probable. Here is a scan of the tourist pouch packaging. 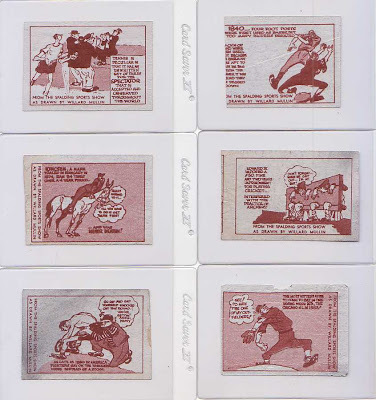 This and the other two black & white scans in this post are taken from Chris Benjamin's The Sport Americana Price Guide to The Non Sports Cards No.2, as essential a hobby guide as there is, as I have been unable to find any pictures in color (or any, period). That measures out at 1 3/16" x 2 5/8" (NOTE 9/10/11: Actually, it doesn't measure out that way. Time trip to here for details), and would be wrapped around a slightly wider (the ends would stick out) piece of foil-wrapped gum, just like Topps' changemakers. 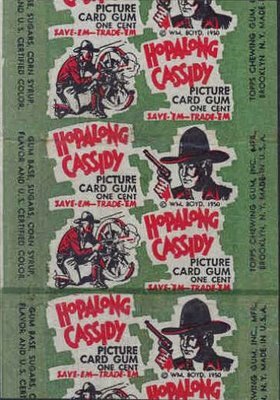 You can also see the little rip at the top, which was a result of the production process, which utilized equipment that also produced the Topps Gum tabs. It is thought 100 subjects comprise the set. Topps must have added additional subjects to the reissue based upon the contest they ran but no full checklists exist. That is not a compilation task I would think easy should someone decide to undertake it. 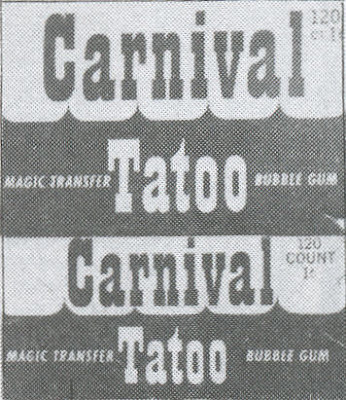 I can't grab a good scan but the '53 box dropped the Carnival branding. The set is described as 150 subjects but who really knows? 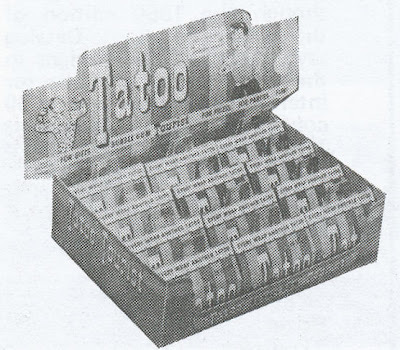 Topps would be more occupied with producing cards for the next two or three years but began a long run of tattoo issues starting in 1956. 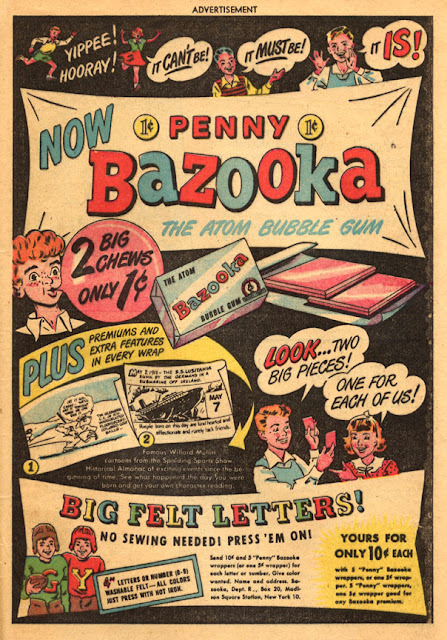 The "twin chew" idea added the idea of value to the product and the inclusion of not one but two comics was a smart move to keep the kiddies looking for more subjects, all the while buying more gum. 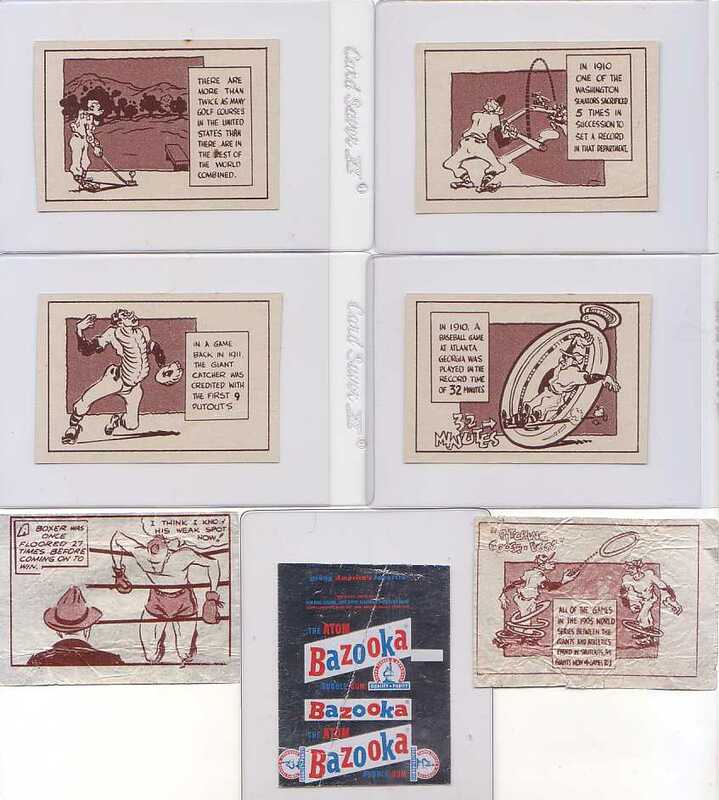 The Willard Mullin Spalding Sports Show comics (ACC# R414-1) were on the back of the foil wrapper (and may also have been briefly issued with the Topps Gum "changemakers"as well) as were the Famous Events comics (R711-4 in the ACC, which also gave this issue that name) so it appears you would get either one or the other (and possibly, eventually a third, see below). Additionally, there was a premium offer for felt letters and numbers, staples of the Topps catalog for many years. 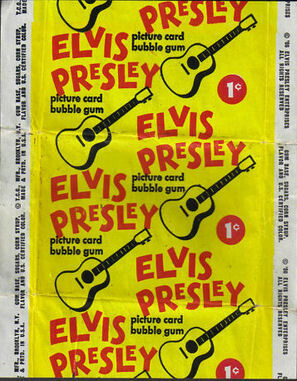 The retailers also got a premium certificate for their own use inside the counter carton, to encourage that they sold as many pieces of gum as possible. I've covered the Mullin cartoons here before but here'a few more for you to look at. Some dates are associated with more than one event, which makes me wonder if the series was reissued at some point. Not the prettiest of issues but it does have a certain rough charm, like all of the issues of the period (at least to my eyes). Apologies to those who sent me the Mullin and Mullin-esque scans as I cannot recall where they originated. There is a lot going on here. We have the full 50 card series shown, although not fully realized on each hemisphere, plus what looks to be a misplaced horizontal gutter below the fifth row. You can see how the left and right sides are cut close and there would have been two more cards on the left side, leftmost plus a final column hard right. 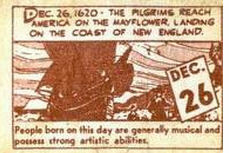 This was either a proof sheet or something that came off the Lord Baltimore Printing press incorrectly and was pulled (and saved, obviously). You can see how the left and right sides, if in their full array, would each make up a half sheet of a full, 200 card behemoth. 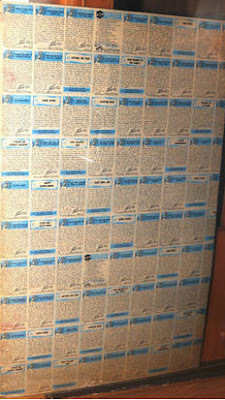 I originally thought maybe Topps was working in quads but the consensus is that this sheet is just an oddity and shows the break between sections. 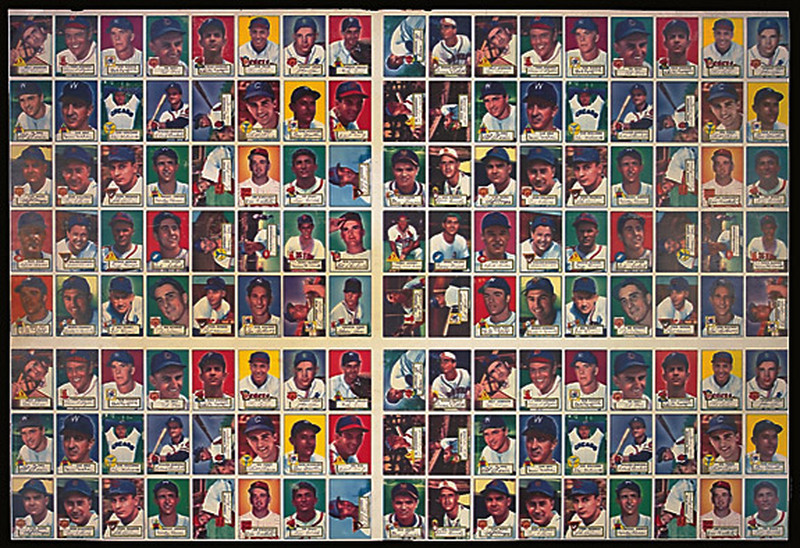 The full sheet would then have four iterations of each card and as anyone who collects this set knows, the second series is abundant. Following the series by sheets (or vice-versa) the first was 80 cards, the second 50, the third 60 and the fourth 60 as well, depositing us at #250. 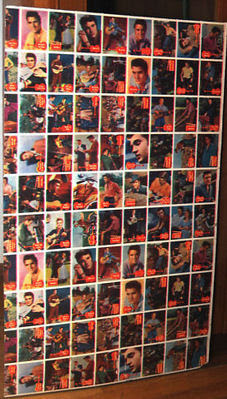 The fifth series, known as the semi-highs, would run another 60 cards and would be printed in lesser quantities than the previous series. This, of course, left room for the highs, beginning at #311 (Mantle) and then ending at #407 (Mathews), with three double prints (the Mick, the Staten Island Scot and Jackie) filling the three holes. I believe that the highs were printed in roughly the same quantities as the semi-high's, as the rationale for issuing the 6th series (which had not been originally contemplated) was that the 5th was selling well. 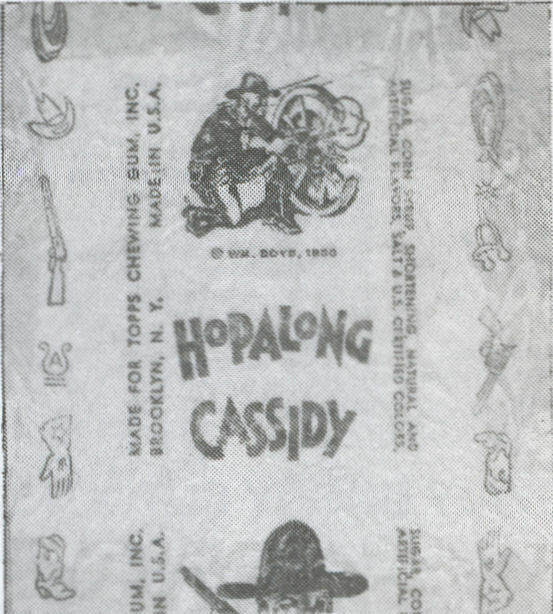 Topps ultimately compromised the final run by destroying their remaining stock of high's in later years. I am not certain if Topps would start mixing one series with another as they rolled each out in '52 but they were clearly experimenting with the length of each series as they puzzled out this classic issue. We thus get overprints for all but the second series (40 in series one, 20 each in series 3-5) and perhaps some of the counts were influenced by contractual concerns for players who were in Bowman's stable as well. 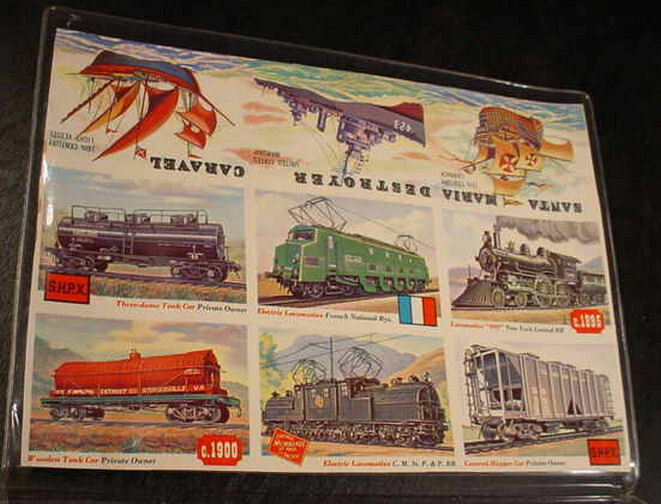 I really like the fact it's still not possible to exactly piece together the story of the 1952 set! 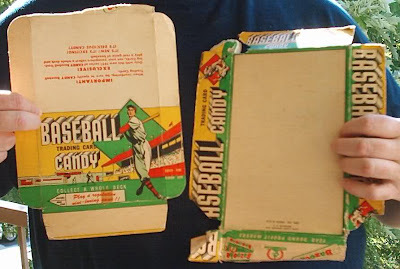 An interesting find popped up on Net54Baseball.com this week, namely a tattered 1951 Baseball Candy Box. These would have sold the nickel packs of either Red or Blue Backs, with some Team Cards and Connie Mack All Stars inside (or, if they were blue Backs, the uber-rare Major League All Stars) .Condition aside, since you don't see these every day, it offers a real nice look at the graphics. COPR. 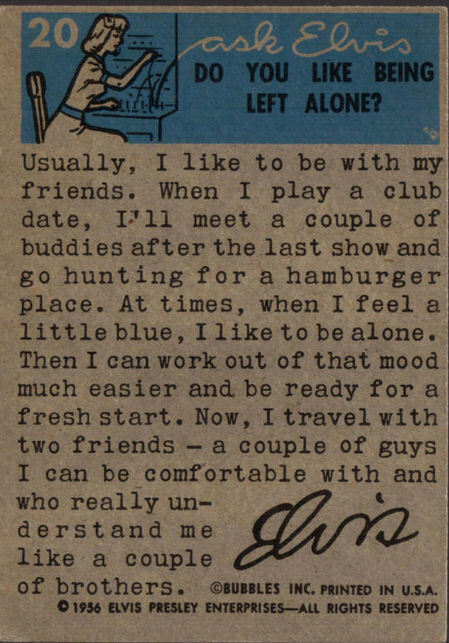 1951 Printed IN U.S.A. I find this interesting as Topps was using their Chattanooga Tennessee plant at this time to produce candy, although it would not remain open much longer. 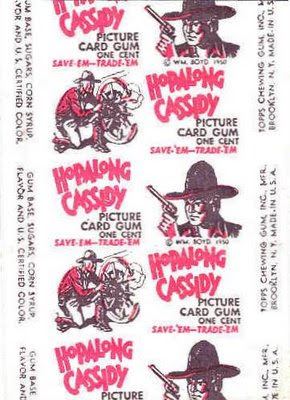 A Topps Chewing Gum identification was probably verboten as Topps could not market cards with gum thanks to Bowman. So voila! Topps Candy! Based upon the box advertising, Topps clearly expected kids to collect the whole deck of 52 cards. The It's New! tagline makes me think this box had the Red Back version of the deck. Sold in a 2004 Mastro auction, the gutter separating the Rails and Sails stamps differs from the way the cards were printed as there was no separation of genres. These would be related to the just-as-rare Topps baseball stamps from 1955, unblogged upon here at present. I've never seen any other examples of the stamps! Their existence though, helps show the flip-flop orientation of the Sails rows. 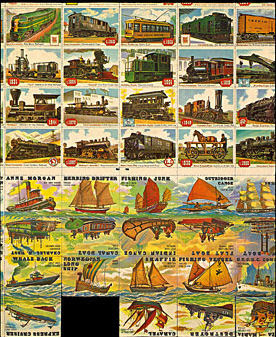 Some partial stamps are also present, a tantalizing hint of a larger sheet. 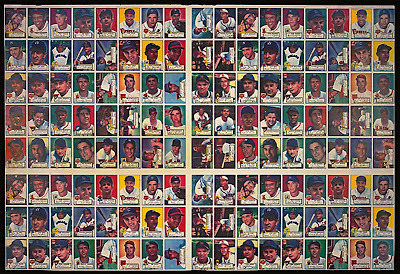 I am not certain if the set was printed in a 100 or 110 card configuration, although I slightly suspect the latter as the baseball cards from that years were arrayed 11 x 10 on each half sheet, for a 220 card full sheet. 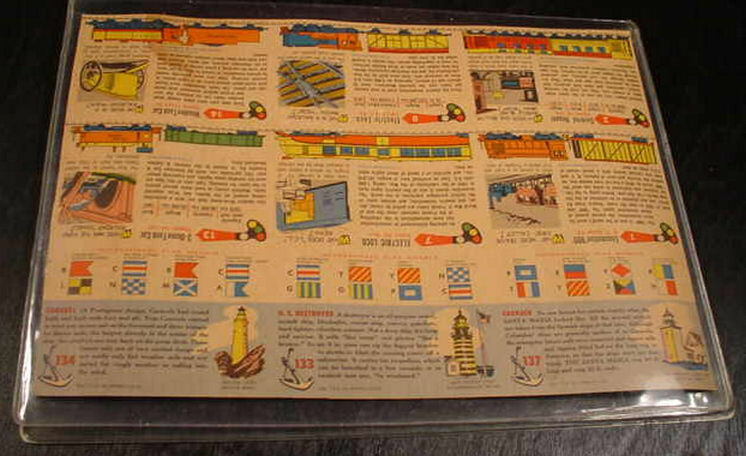 The cards though, are also printed schizophrenically as #1-80 (all Rails) and 131-150 (all Sails) were printed together in a first series that would probably have three groupings of the 20 Sails and two of the 80 Rails (or one less grouping of Sails if a 100 card array was used). 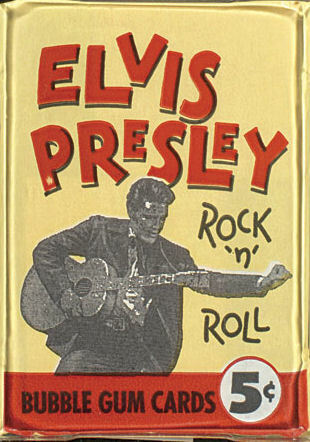 This type of series breakage was used for the 1954 baseball cards so a 100 card array is certainly possible. 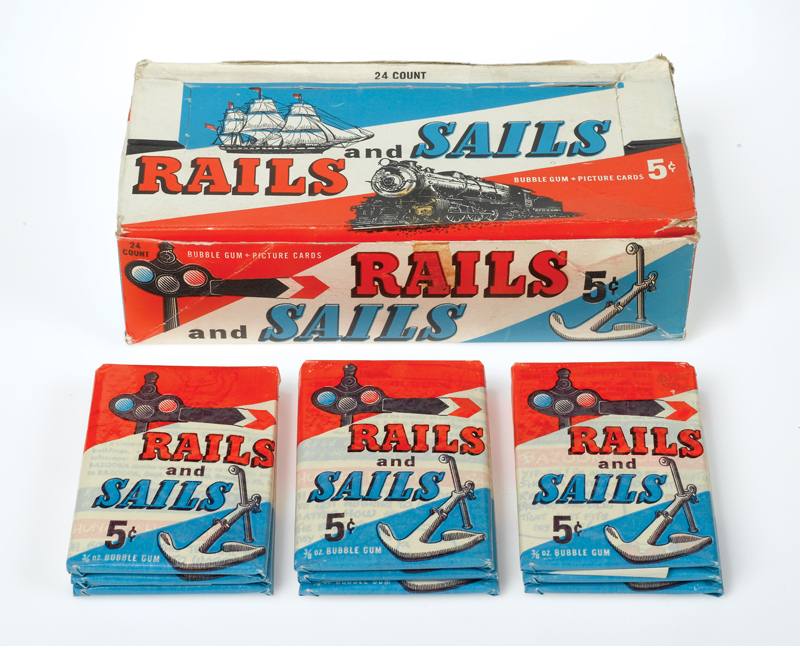 The second series was printed in significantly lesser quantities and features the opposite chunks o'cards: #81-130 for the Rails and #151-200 for the Sails. 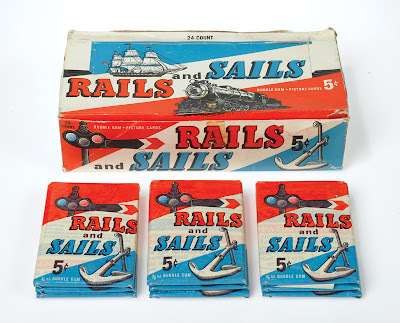 100 cards per half sheet would work out neatly but the stamp configuration makes it seem like a row of Sails could have been slipped in between the Rails and Sails, meaning a likely extra row of Rails and one of Sails for a 110 half/220 card full sheet. Whew! See-I told you it was nice-one of the great sets of the 50's, no doubt about it!